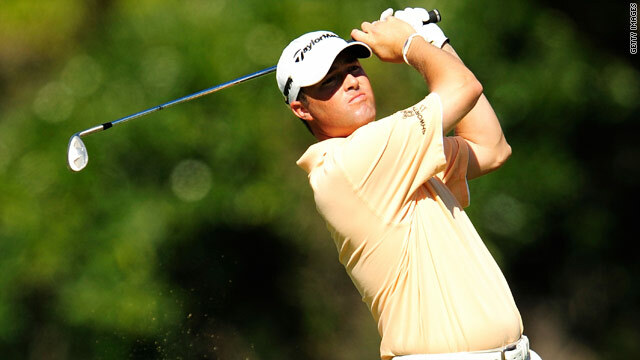 American Ryan Palmer took advantage of Robert Allenby's missed putt on the final hole to secure victory in the Sony Open. (CNN) -- Ryan Palmer landed the third PGA Tour title of his career, winning the Sony Open in Hawaii on Sunday at the 72nd hole from Robert Allenby. Having dueled all day with his American rival, Australian Allenby missed a 10-foot putt at the last to leave fellow 54-hole leader Palmer with a tap-in birdie, after his chip off the green had hit the flagpole, for victory at the par-70 Waialae Country Club. Palmer's four-under-par 66 gave him a 72-hole total of 15-under-par and a one-stroke victory over Allenby (67), with world number three Steve Stricker a further shot back following a 66. Retief Goosen had earlier set a low target with an eight-under-par 62 and the South African held the clubhouse lead until Stricker finished in the third from last group. In ideal conditions, Goosen recovered from an opening bogey to send down nine birdies -- match his career lowest round, recorded at the 2001 Scottish Open at Loch Lomond. Goosen finished alone in fourth while a 64 from Charles Howell III sent him to 12 -under in a tie for fifth place with Sweden's Carl Pettersson (66) and Davis Love III (67). England's Justin Rose finished strongly with a 64 to get to eight-under and a tie for 12th on his 2010 debut, his first and third rounds of 72 and 71 preventing a higher finish having posted a second-round 65.